People are naturally attracted to images. According to Rand Fishkin’s analysis, a third of all searches performed in Google are for images, and 12.5% of SERPs show Image Pack results. Let’s see how to improve our image SEO with some basic, very simple, tips and best practices. You can figure out if image SEO is actually something you should be doing by checking Google itself for any given keyword you are interested in. If at the top (and often together with the ad result), you see the image block with a few photos in there, then it’s worth trying to rank here. This is because Google is only going to show that image block if and when the searchers actually click on the images frequently, or if anyone searches directly on Google Images for that term. Many people like decorators, remodelers, hotel owners, or craft sellers, for example, find that image search is something people do as part of their research before choosing to hire them. When you optimise images correctly, you elevate the overall SEO of a page or a post. Images can really contribute to the Search Engine Optimisation of a page or a blog post so that it can rank better. 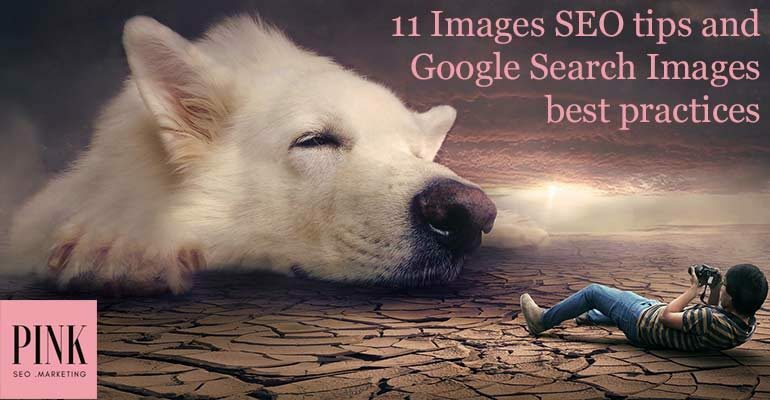 The rankings elements for Google images are actually quite broad, but they’re not complicated. Make sure you create some guidelines for content creators/publishers who add images on your website, so they will remember to pay attention to at least some of the below-mentioned criteria. (And the most important ones specifically). The alt attribute on the image. Alt attributes are meant for visually-impaired people, but they do help with Image Search SEO and web results SEO too. We’ve seen far too many keywords-stuffed alt attributes, which don’t help with your SEO anymore. If you want to provide a really natural alt description, think of it as something that needs to be accessed by a program designed for “reading” and describing pictures to people who can’t see them. Explain in brief what the picture is about to someone who can’t see it. That way you’ll create a natural-enough alt description. To add alt attribute to an image, select it in the Media Library and add it as shown in this screenshot. The image caption. The caption may actually be more important than the alt attribute when it comes to Image Search rankings. Just ensure that your theme does indeed display image captions, as some don’t. In that case, the caption would be something that’s written in the code but not displayed. This is known as “invisible text” and is one of the oldest black-hat SEO tricks that people used to use to manipulate SEO. Google may penalise you quickly if you use captions that aren’t displayed. Surrounding text content. Google checks if the text above, below and around the images has relevance with the meaning expressed (keywords included) by the picture. This is one of the reasons why galleries of images don’t rank so well, as they have very little relevant content surrounding them. In many cases, there are tons of images all on one page. But all that Google is looking for is just one or two that are hyper-relevant to the particular topic. This is why most of the images which rank well in Google Image Search are the main image on that particular page. The URL that it’s hosted on. We know that having a keyword in the domain name no longer carries the weight it used to in terms of helping a website to rank. While domain names that include keywords are no longer sold for crazy amounts of money, having a keyword in the domain name still matters. And this is certainly true for some sites which are not so new and began their ranking/trust/authority history when it was this was an important factor. Image engagement and popularity is very important. Because Google RankBrain‘s intention is to provide Google users with very relevant and useful content, engagement and popularity, what people scroll to, what they click on, and what they click through to matters as a good sign of relevance. Once again, quality wins. In this case, quality means having very high-quality, highly interesting, highly-relevant images, which provide something useful and important to the search intent of that page. You can read more about this in our article on the unicorn marketing theory. For this very same reason, embedding images seems to have a positive impact on ranking as well. This is especially true if the images appear on many different websites and pages, and if they’ve been embedded multiple times. The images dimensions matter. Google Image Search generally ranks 16 by 9 and 4 by 3 images. It rarely shows very weird image dimensions, including very horizontal or very vertical ones. Also, remember that image dimensions are very important for optimising the loading speed of your page, which is something we will talk about very soon. Don’t upload a full image if you’re only going to display it in a smaller size. Google will have to load it entirely every time it loads the page, just to then resize it and displaying it in the size you use in your theme, for example. This can slow pages down, and it’s something we see A LOT. Page speed greatly matters as a ranking criterion, so just resize any images to the exact side you’ll need for the page before you upload them onto your website. Image size. Google is generally not looking for very small images. But they don’t usually show gigantic ones either. Plus, seeing that large images slow web pages down, they should be avoided. After you’ve resized an image, try working on its quality. Generally, decreasing the image size doesn’t negatively impact its quality and the way it looks on screen, so it’s something we’d recommend you do. You can use plenty of image compression tools, which help you reduce the weight of an image without impacting its quality. Web page ranking factors. If a page ranks well, any images from it may rank in the first few image results. But the reverse isn’t always true. Image relevance and visual match. Google seems to finally be able to detect this, so don’t try and play tricks. A picture won’t probably display for words that aren’t relevant to its real content. We hope this guide helps you get a clearer picture of image SEO. But if you’d like to know more or ask for advice, don’t hesitate to contact us!